Stylist Bows The only supplier we know of that will let you hire and try before you commit, so you only ever end up with equipment that is perfect for you! Carter Enterprises Best known for their release aids that are amongst the best in the world. Custom bow grips from Bob Lambeth. He provides a very helpfull and freindly service in making custom side plate grips for all popular makes of compund bow. A very friendly climbing wall local to us Wolf Mountain also provides archery courses/sessions mainly geared to small groups of junior shooters, as well as providing excellent climbing facilities. A great way of improving your strength and having fun at the same time. 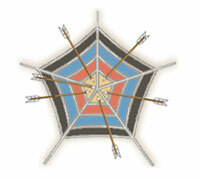 Archers Reference perhaps the best on-line guides for recurve archers. Here are two Excel spreadsheets developed by Simon Hughes, one of our compound archers. Click here for preview. They are designed to help fine tune sight marks. Enter your sight marks in the yellow boxes provided in the top left hand corner. The spreadsheet will automatically calculate the curve fit and the equation. Enter the equation numbers into the yellow boxes above the chart. Your sight marks will now be shown to the left of the chart. Print it out and keep it for when you shoot. Hint: get all your sight marks on ONE day. Different days make your arrows shoot higher or lower depending on the weather, etc.